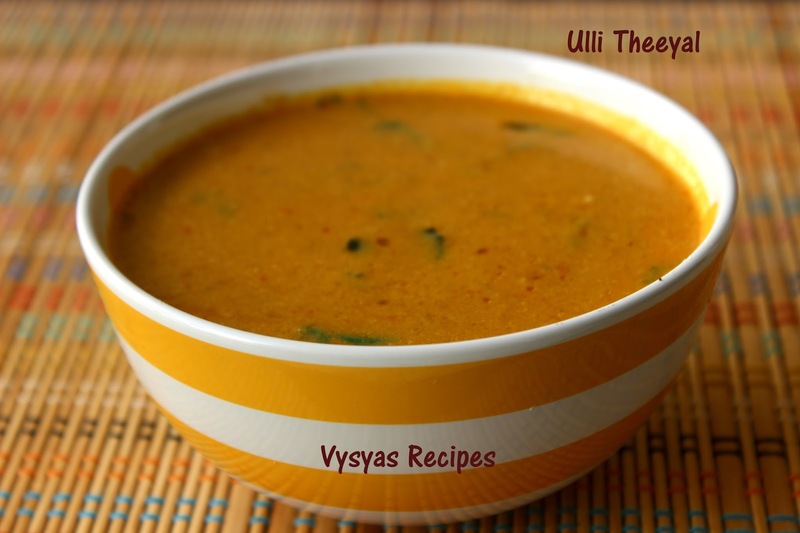 Ulli Theeyal is a Classic Kerala Tamarind Coconut Gravy made with Pearl Onions Simmered in Tamarind & Coconut Mixture. This is similar to South Indian Puli kuzhambu. It Goes well with Steamed Rice, Kerala Parotta & Idli, dosa too. you Can make this theeyal with vegetables like Brinjal,drumstick, bitter Gourd & okra. Aroma of Gravy Comes from 'Theeyal Masala'. This masala is made with Spices & Coconut Roasted in Coconut oil, which makes the dish so delicious. Cook Time : 15 minutes. Pearl Onions - 25 . Tamarind - Big Goosebery Size. Coconut oil - 2 tsp. Coconut oil - as Needed. Soak the tamarind in 2 Cups of water for half an hour, then squeeze the tamarind & throw the Pulp. Now tamarind water is Ready. Add Coconut oil in a Pan add Coriander seeds,Cumin seeds,Pepper Corns & Red Chillies.Saute till you get nice aroma. Now add Coconut. Saute till Coconut turns Golden. Then Grind this Coconut Mixture into a smooth Paste with 1/2 cup of water.Now Theeyal Masala is Ready. Heat the oil in a Pan. Add mustard seeds.When it splutters add Cumin seeds,fenugreek seeds,Curry leaves & Red chilly. Saute till Cumin seeds sizzles.Add hing.Give a quick Mix. Now add Pearl Onions.Saute till Pearl Onions turns Soft & Golden brown slightly. Now add tamarind water. When it starts boiling add 'Theeyal Masala', turmeric Powder & salt. Boil until theeyal thickens & oil Separates. Now Ulli theeyal is Ready to serve. Adjust Red Chillies according to your spice level. Always Roast the Coconut in Coconut oil for nice aroma. Adjust the water,according to the consistency.